Atlantic South Region: Congrats to The Villages Winners! An Advanced Pickleball Round Robin took place at The Villages, Florida from August 22nd through August 25th. 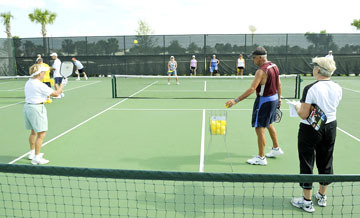 Competing in this Skill Level event were Villages resident players rated 4.0 -4.5. The very best competitors brings out lots of spectators, and this event was no exception. Runners-up: Bill Freeman and Deb Harrison. Runners up: Christina Crenshaw and Barb DeWitt. Runners-up: Bill Freeman and Jeff Shank. An article in the The Villages Daily Sun, April 15, 2011, featured the Community Volunteer Group (PCVG) that set up a rating system for the communities residents. Pictured at this rating clinic is Deb Harrison (left) assisted by George Wijma and Rosamarie Pietromonaco. The ratings system," said rating chairman Tom Nonnemacher," helps Villagers enter into leagues and tournaments that will suit their playing ability." Clinics were held where each player’s rating was calculated by teams of three judges. A player was judged on their aptitude with the variety of shots the game demands: Serves, serve return, volleys, smashes, dinks, forehands, backhands and several other types of shots.